Namaste! We Are Warmly Welcomed The Traditional Indian Way With Hands Clapped Together. After Immigration And Custom Formalities, We Are Transferred To The Hotel. Morning Drive To Agra. On Arrival In Agra, We Check-In At The Hotel. Afternoon Visit One Of The Best Known Wonders Of The World, The Taj Mahal. Built By Shah Jehan As A Mausoleum For His Favorite Wife, Mumtaz Mahal, The Taj Is Built Of White Marble, Beautifully Carved And Inlaid With Semi-Precious Stones. Overnight At The Hotel. Morning Visit Agra Fort, Where Shah Jehan, In The Later Years Of His Life, Was Imprisoned By His Son To Prevent Him From Spending The Family Fortunes On A Black Echo Of The Taj Mahal. Later We Drive To Fatehpur Sikri, The Beautiful Capital Built In 1640 By The Mughal King, Akbar The Great. The City Was Later Abandoned For Lack Of Water. A Superb Example Of Mughal Architecture, It Stands Perfectly Preserved In The Desert. We Also Visit The Artistically Designed Mausoleum Of Salim Chisty Who Is Reputed To Have Prayed For A Son For Akbar Leading To The Birth Of Salim Jehangir. Overnight At The Hotel. 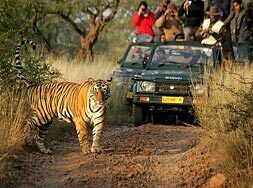 In The Morning After Breakfast We Drive To Ranthambore, The Former Hunting Ground Of The Maharajas Of Jaipur, The Ranthambore National Park Is Situated In Eastern Rajasthan At The Confluence Of The Aravali Hill Ranges And The Vindhyan Plateau. Two Rivers Flow Through The Ranthambore National Park - The Chambal River In The South And The Banas River In The North. Six Man-Made Lakes And Many Perennial Streams Pass Through The Entire National Park. 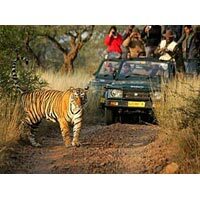 The Ranthambore National Park Is Nestled Between The Aravali And Vindhya Mountain Ranges. The Rugged Terrain And The Dense Deciduous Forests Are Major Features Of This National Park, Which Has Among The Largest And Most Diverse Collection Of Wildlife Species In India. On Arrival In Ranthambore, We Check-In At The Hotel. In The Afternoon We Take A Safari Through The National Park. On Our Journey We Will See Various Indigenous Animals Such As: Nilgai, Chausingha, Chital, Chinkara, Wild Boar And Tiger! Other Habitants Of The Park Include The Muntjac, Jungle Cat, Ratel, Hyena, Porcupine, The Rhesus Macaque And The Black-Faced Langur. About 150 Species Of Bird Are Also Found Here Including Migratory Birds, Like The Steppe Eagle, That Arrive In Winter. Overnight At The Hotel. Early Morning Safari Through The National Park. Return To The Hotel For Breakfast And Rest Of The Day Free For Relaxation And Individual Activities. Overnight At The Hotel. Morning Drive To Jaipur, The Rose Pink Capital Of Rajasthan. Jaipur Is Filled With Frenetic Crowds; Rajasthan'S Chaotic, Dusky - Pink Capital Is A Place Of Wild Contrasts, Bombarding The Senses At Every Turn. Jaipur'S Old City, It'S Rich Color Deepening And Fading According To The Light, Is Lined With Long, Twinkling Bazaars. Like Wacky Races On Acid, Vegetable - Laden Camel Carts Thread Their Way Through Streets Jam-Packed With Cars, Cows, Rickshaws & Bicycles. The City Owes Its Name, Foundation And Careful Planning To The Great Warrior -Astronomer Maharaja Jai Singh Ii (1693 - 1743). Afternoon Visit Local Bazaar For Shopping Tour. Overnight At The Hotel. 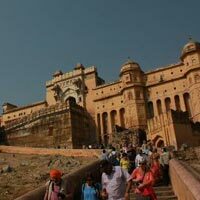 A Royal Experience Awaits Us As We Take An Elephant Ride Uphill To The Intriguing Amber Palace, A Distinguished Example Of 17Th Century Rajput Architecture. After The Tour And Enjoying A Panoramic View, We Return To Jaipur To Visit The Old Astronomical Observatory Built By The Founder Of The City, Jai Singh. 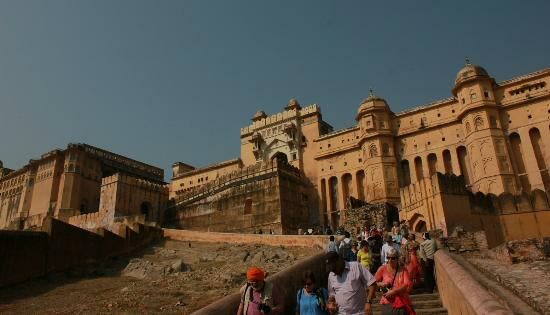 We Also Visit The Majestic Palace, Which Houses A Rare Collection Of Indian Art, And The Colourful Bazaar. Jaipur Is Noted For Its Craftsmen, Skilled In Brass Inlay, Lacquer Work And Stone Setting. Most Of The Buildings In The Old City Are Made Of Pink Sandstone And One Of The Most Beautiful Is Hawa Mahal- Palace Of Winds, Where The Ladies Of The Royal Harem Used To Watch The City From Behind The Intricately Carved Facade. Evening Is Free To Enjoy Both Shopping And A Cultural Experience In The Bazaars Of Jaipur. Overnight At The Hotel. Today, We Drive To Delhi. On Arrival In Delhi, Evening Free For Individual Activities. In Time Transferred To Airport For Our Flight To Onward Destination.